Parents with Special Needs Children Use Nutrition to Increase Focus and Attention! Parents of children with autism are learning that food choices can help their sons and daughters become healthier and reach their full potential. In addition to traditional behavioral therapy and other pharmaceutical treatments, pediatricians, researchers, and nutritionists increasingly recommend that parents implement autism diets, autism-specific nutrition, and specialized supplementation. Even television’s respected Dr. Oz recently said, “Some of the most promising treatments for autism come from changing the foods that the child is eating.” Respected pediatrician and author of “The Autism Book,” Dr. Robert Sears says that 75% of his patients following the diet see great improvement. Doctors now recognize that the bodies of children with autism are unique and require very specific care, including special enzymes for digestion, medical treatment for yeast infections and other common conditions found during testing, attention to digestive issues, special dietary requirements (autism diets), nutrient and fatty acid supplementation, behavioral therapy, and more. The outdated model sees autism as a “mysterious” psychiatric disorder that begins and ends in the brain—and reports that little can be done to impact its effects. Through the breakthrough work of the Autism Research Institute a more appropriate “whole body disorder” (the brain is affected by the biochemistry generated in the body) perspective of autism has emerged. When seen as a whole body disorder, parents and physicians are more likely to identify the physical symptoms of autism that often get overlooked including diarrhea, constipation, bloating and GI pain, inflammation, and frequent infections. With this broader comprehension it becomes apparent that there is a great deal that can be done to address these challenges. Step one is to take charge of diet. When parents correctly implement specific autism diets, improvements in gastrointestinal problems (including diarrhea and constipation), language, learning, focus, attention, eye contact, behavior, sleep difficulties, toilet training, and skin rashes/eczema have been observed. Parents around the world are beginning to share their stories of healing. Since every child is unique, improvements will vary. It’s important to understand that these diets are customized food-focused strategies of nutritional intervention for autism. Going from not considering the impact of food intake (standard American diet) to giving specialized attention (nutrition centered diet) is the key to promoting systemic healing through autism diets. All autism diets involve the removal of problematic foods and substances, and the addition of easier to digest nutrient dense foods. Certain food substances, such as gluten (wheat) and casein (milk) are known to be problematic for many children with autism, and should be avoided – and other foods rich in healing nutrients are beneficial when added to children’s diets. Attention to these factors is intended to help balance biochemistry, affect systemic healing, and provide relief of autism symptoms. For many children with autism, nutrient deficiencies, chemicals in foods, imbalanced biochemistry, and digestive problems can play a significant role in their physical conditions. Their physiological and behavioral symptoms may stem from, or be exacerbated by, impaired digestion and GI health. Altering food choices positively affects these processes and helps improve symptoms. There are several diets that are used by parents, autism nutritionists and pediatricians. These diets include the Gluten-Free Casein-Free (GFCF) Diet, Specific Carbohydrate Diet (SCD), Gut and Psychology Syndrome (GAPS) Diet, Low Oxalate Diet, Body Ecology Diet, Feingold Diet and Weston A. Price dietary principles. Parents begin with simple steps: more fresh fruits, vegetables and grass-fed meats whenever possible. They read labels for ingredients and clean out their cupboards. They shop for organic foods in order to remove antibiotics, hormones, pesticides and PCBs from the dinner table. They naturally avoid pre-packaged, canned or frozen foods that contain preservative, additives, colors and artificial ingredients. They immediately decrease the amount of sugar they feed their children. The guidance of a qualified nutrition profession is always recommended. After the initial clean up steps are completed, parents embark on the implementation of an autism diet, which typically begins with removing gluten and casein—as implemented in the GFCF diet. Gluten is the protein found in wheat, rye, barley, commercial oats, kamut, and spelt. Casein is the protein found in dairy. The GFCF diet has become popular for autism and the general population, and there are many GFCF foods available in stores. Parents applying a GFCF diet cook from great recipes they find online and in autism diet friendly cookbooks. Autism Research Institute (ARI) surveyed thousands of parents and found that 69% of those applying the GFCF Diet saw improvement. For the Specific Carbohydrate Diet, 71% noted improvement. In recent autism diet research funded by Autism Speaks, 82% of parents reported “definite improvement” in their child’s skills. For the parent of a child with autism, the food that they choose to serve their children is vitally important to their healing. 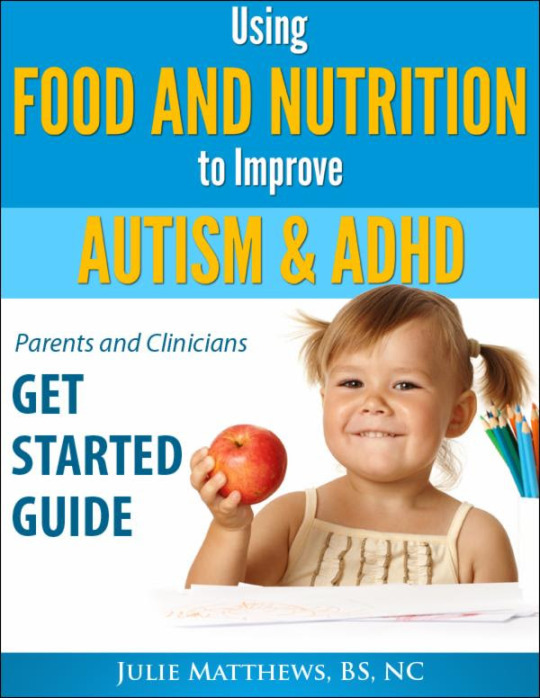 Autism diets are an important first step all parents should consider as they are creating a program for the improved health and well being of children. Julie Matthews is an internationally respected Certified Nutrition Consultant, autism nutrition specialist and author of the award-winning book, “Nourishing Hope for Autism” and the creator of “Cooking to Heal: Autism Nutrition and Cooking Classes” (DVD). Julie provides diet and nutrition intervention guidance backed by scientific research and applied clinical experience. She presents at the leading autism conferences in the US and abroad.